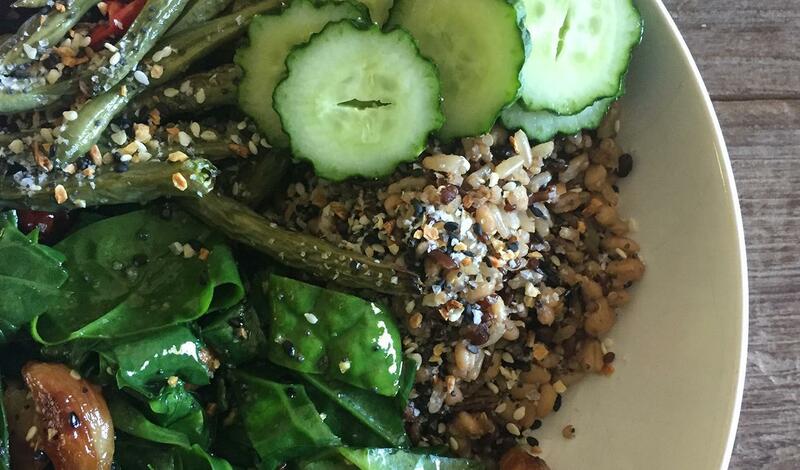 Grains combined with trendy Shishito peppers and other green vegetables create a flavorful "green" bowl. Peel garlic and place in a sauté pan with the olive oil. Toss and place in the oven. Roast for 15 minutes or until lightly brown and caramelized. Toss the Shishito peppers and green beans with oil, salt and pepper. Roast for 25 minutes, or until golden brown. After the garlic is cooked, carefully take pan out of oven. Remove garlic with slotted spoon and set aside. Reheat pan over high heat. Once hot, add the Malabar spinach and cook for 1-2 minutes until soft but not overcooked. Toss the bulgur and wild rice mixture with balsamic dressing. In a wide bowl, place 1 cup of the warm cooked bulgur and wild rice mixture. Add a portion of green beans and 5 Shishito peppers, add Malabar spinach and a few cloves of roasted garlic. Garnish with slices of Asian cucumber and serve.